Last year Halloween Horror Nights @ Universal Studios Singapore sold out fast. This year Halloween Horror Nights … is BACK ! You can experience the horror again on 19 to 21 and 25 to 28 October 2012 from 8pm to 12 midnight. Did you missed last year’s horrifying night? This year Halloween Horror Nights 2 promises to be more horror! DOUBLE the number of scare actors and UPPING the scare factor. There will be five scary zones and three haunted houses. They are not just playgrounds … they are TERROR maze! The Puppet Master with his sinister Doctor Dementia, The Undertaker and The High Priest will be there TERRORIZE you! Will you become one of the Puppet Master’s victims being tortured in his workshop of dolls … turns into one of his imaginary friends in his demented world? Are you drawn by a monstrous dark energy in The Dungeon of Damnation and come face to face with your worst fears ? Can you feel the paranoia as you venture into The Insanitarium, the world of the criminally insane and ancient curses of The High Priest? CAN YOU SURVIVE … ? Event tickets purchased before 1 October 2012. Event tickets purchased from 1 October 2012 to 28 October 2012. Upgrade your Universal Studios Singapore Day-Pass purchased from 15 Aug to an event ticket. Flash your hotel key card at any Universal Studios Singapore ticket booth. 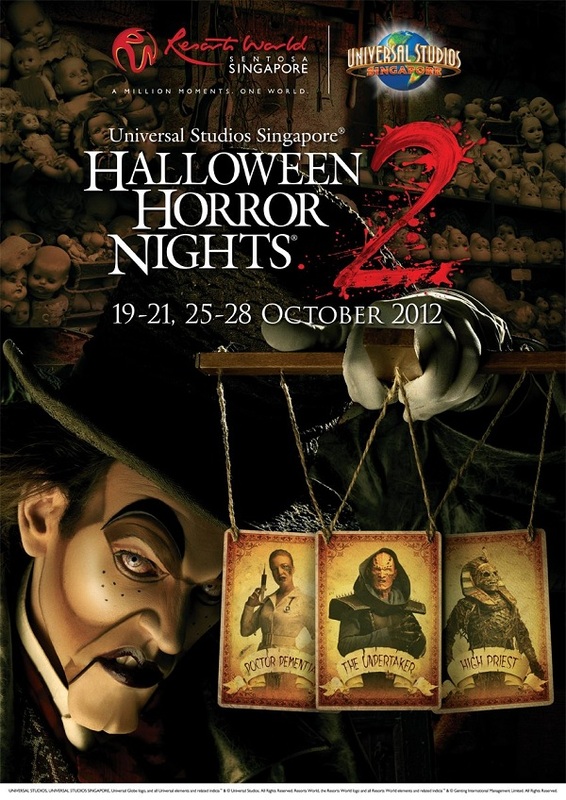 Tickets can be purchase from Universal Studios Singapore ticket booth and online from 24 August 2012. For further information and to buy event tickets, visit RWS website. * Halloween Horror Nights 2 may be too intense for young children and is not recommended for children under the age of 13. No costumes or masks are allowed.